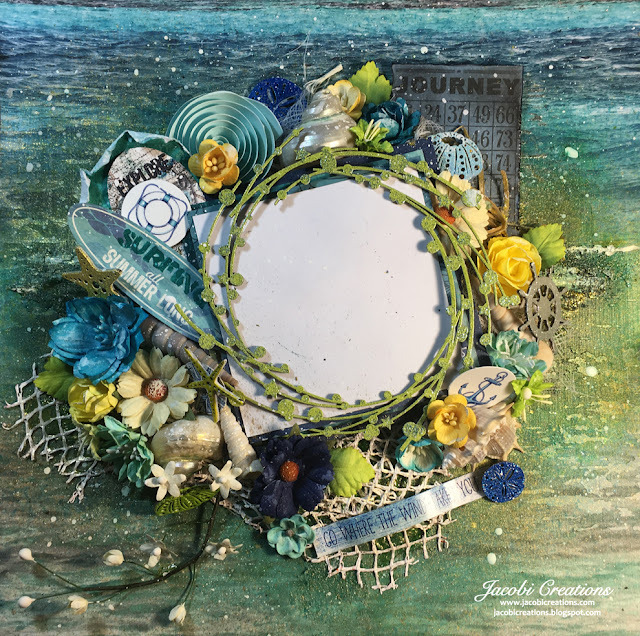 Layouts to do with the ocean or the beach are always my most favourite layouts to do and this one was no exception either. 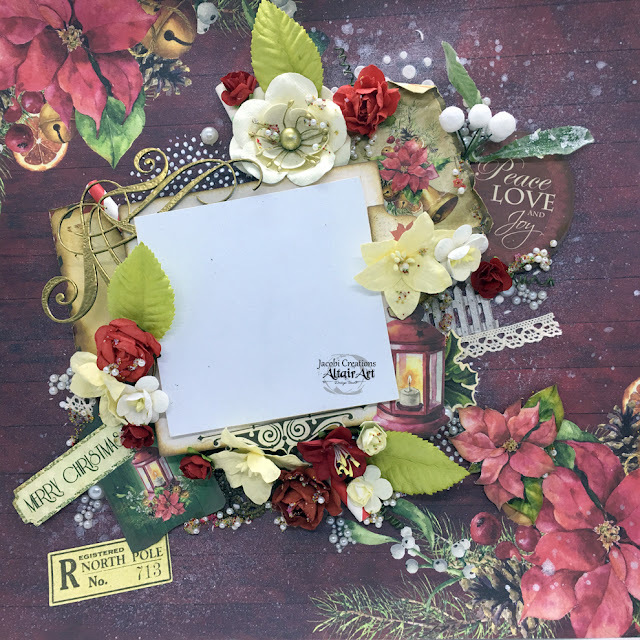 i got to use lots of Dusty Attic chippies throughout along with various pieces of Kaisercraft ephemera. To create the netting I had an old netted bag that onions and lemons and limes comes in, then painted it with a few coats of white gesso and it worked absolutely brilliantly. This was a very pretty and enjoyable layout to do, I very much enjoy doing orange layouts for some reason, but even when I had my graphic design business I used a deep yellow alot as it works with so much. Funny. Definitely one of my favourite layouts currently, alot of my green layouts I do like alot to be honest. This one is for the World's Greatest Dad and perhaps I need to keep this one for myself and put the Dad that is my beautiful partner in it, well, not him, just a picture of him! I used the pretty chipboard of little hearts from Dusty Attic in this along with one of their stencils. Anyway, I hope you like it. Choose Happy - what a truly great choice to make! I noticed years ago how much pink and orange go together. Weird, but they just do. 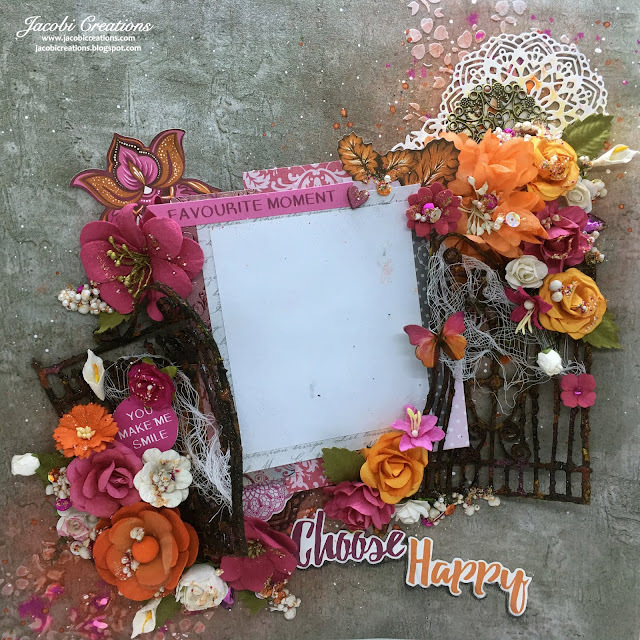 Below is a pretty layout using just these colours featuring the gates that I totally grunged up using the various rust effect pastes. That's it for this one! See you at the next post. Time to get my act back together and start showing off my creativity once again! Despite my lack of posting, I have actually been doing quite alot. 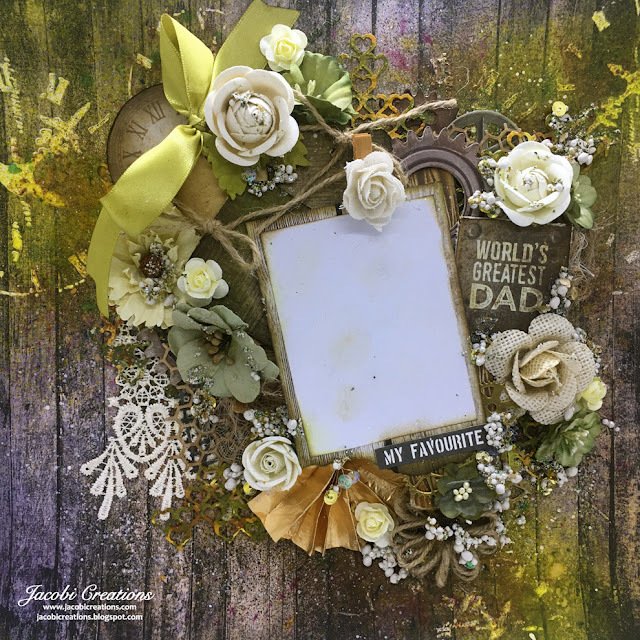 Challenging myself with some projects and then churning out lots of scrapbook pages and enjoying every minute of it. Firstly, a couple of canvases, the first one was very challenging. I even threw it out at one point and then went back and got it out of the bin and kept going and I do love the finished product. 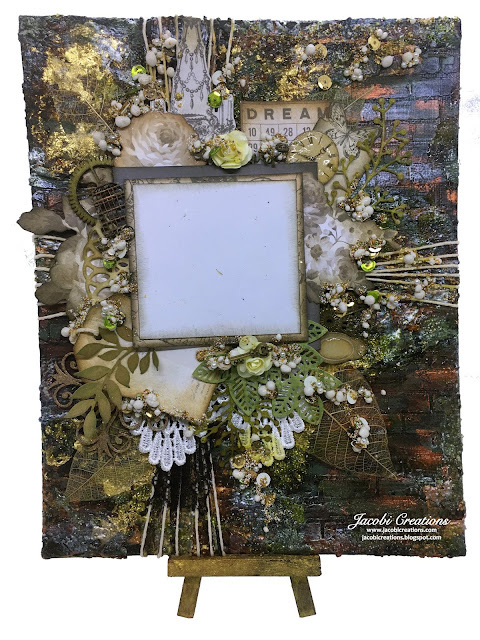 The second canvas I did in landscape format using pretty Finnabair and Dusty Attic stencils, plus some lovely Dusty Attic chipboard pieces. 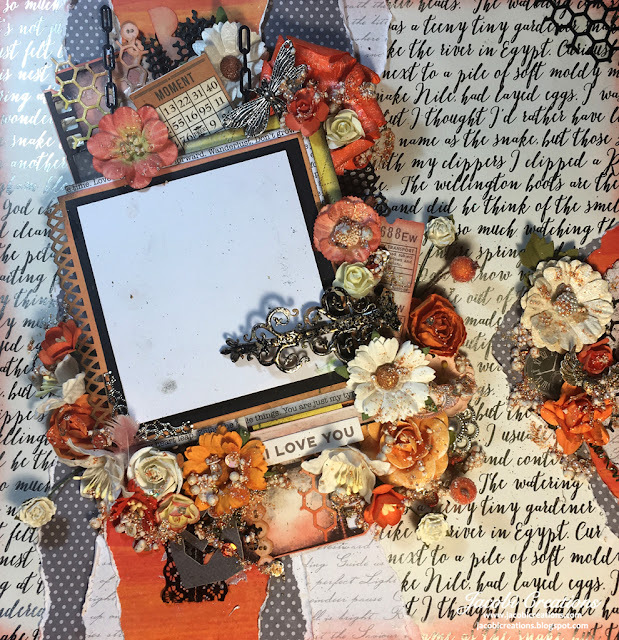 I am trying to teach myself to do the heavy layering that so many of my favourite scrapbooking artists do. Personally, I find it extremely challenging to do as so much goes on and gets covered up I just don't seem to be able to find my peace with it. Anyway, this is my attempt and I am very happy with it, plus it was extremely enjoyable to do! I love this layout as the title suggests!! I am on the road at the moment for a week and I have some better pics of this somewhere, but I just need to post it and share it as it is too beautiful to keep hidden from the world! I have used a fair few chipboard pieces and it just makes the design look so amazing!! By wetting the chipboard pieces you can bend them, which is what I have done to the shutters on the windows and it just gives it all this lovely 3-dimensional look when finished. Creativity Abounds in the new craft room! I have been super creative lately and this is very much due to my new craft room which is actually rather fantastic! Best craft area to date and actually my very last one! Very much custom designed for me so it works. 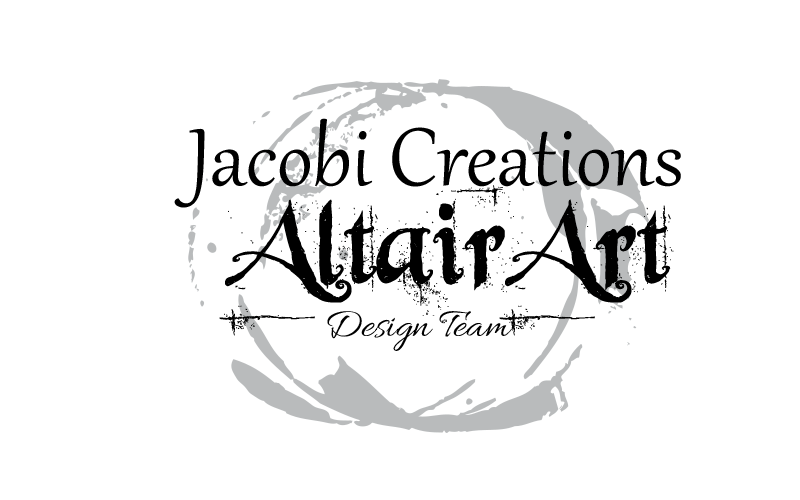 Up until now it has been somewhat difficult to be creative as I had moved and it was hard to get a properly established place. So, the creativity has been happening in leaps and bounds of late and here are a few pieces to show for my productivity.